As the Sun moves into Sagittarius and with a Moon / Uranus conjunction in Aries today, you may be thinking about going off on a grand adventure or pursuing higher mind ideals. You may be thinking about expanding your horizons and taking a leap of faith into the wild unknown. 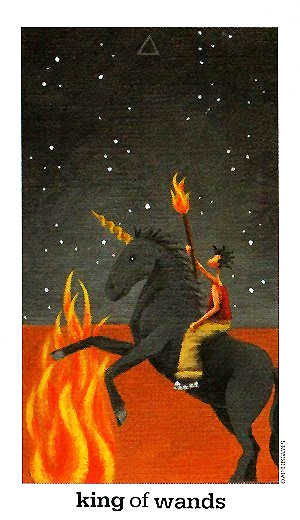 You may be latching onto larger-than-life ideals, like the King of Wands in this card. This version of the King has nothing but the clothes on his back and his torch to guide him as he and his trusty Unicorn gallop off into the night. The pair of them are fearless: they’re not going to let a raging bonfire get in the way of their goals. You may be excited about a trip you have planned or a destination that’s been calling out to you for some time. On a smaller scale you’re still likely to be bursting at the seams with big plans and ideas. You may be feeling more bold, confident and enthusiastic about where you are heading and about what your future holds. The King of Wands may appear as a person in your life. If so, you’ll know him by his dynamic presence and his fearless attitudes. He may be a parent, boss, mentor, lover or companion. Whatever form he takes, know that he’s here to show you how it’s done. He can also represent a state of mind, as in displaying confidence and problem solving skills that draw people to you and elevate you in their eyes. And he can represent an event, such as a promotion or recognition from your peers. However he appears for you today, see it as an indication that it’s time to step and start exerting your own influence. It may be time for you to pick up your own mighty club and show the rest of the world what you’re made of. Today’s New Moon is at 19° Scorpio , a sign associated with mystery, depth, secrets and all that is hidden from view. It represents a time of getting in touch with your feelings and emotions, and getting a better understanding of your doubts, insecurities and fears. 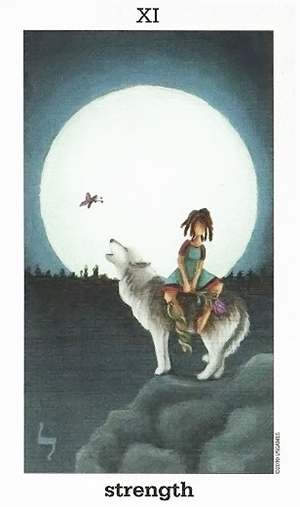 The Moon card is tied to the hidden and mysterious realm of the unconscious, from which all of our instincts and emotions arise. When we’re aligned with that part of ourselves and in sync with our emotions, everything seems to just fall into place — and when we’re not, all hell can break loose. This version is from the beautiful Sun and Moon Tarot from Vanessa Decort. In it an ethereal young woman sits arc of in the crescent moon and looks down on the turbulent waters below. Many versions of this card contain the symbol for Cancer (the crab), yet this version contains the symbol of Pisces (the fishes). Yet there are references to Scorpio as well, thus completely the watery triad. There are the opposing pillars (lighthouses), the black and white dogs, the Hebrew Symbol for resurrection and redemption, and of course the turbulent seas. Today is a day to explore and own rich inner world and immerse yourself in the realm of emotions. And while you do want to be on the looking for things that may at first not be what they seem (as the Moon can also bring confusion and cloud your judgment), it’s also a brand New Moon, which can bring with it a fresh perspective. While you may not want to trust your first impressions or take everything at face value today, the secrets of the Moon always reveal themselves over time. If you’re feeling hesitant about something, put it aside until you feel more comfortable. Your own motivations — and the motivations of those around you — will become clearer to you in the fresh light of day. With Mercury squaring Pluto today, you may have to work to keep your troubled thoughts at bay. This transit can intensify fears and insecurities and leave you questioning what you believe in and what you know to be true. 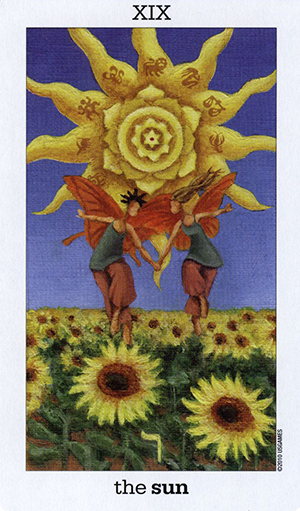 Look at the figure in this card — the Three of Cups from the gorgeous Sun and Moon Tarot. He’s probably seen better days. He sits on a cloud and ruminates on his broken heart… or is it all in his imagination? This is one of the problems that can arise with Mercury square Pluto. The focus is on what could possibly go wrong, bringing doubts and fears and paranoid delusions to the surface. 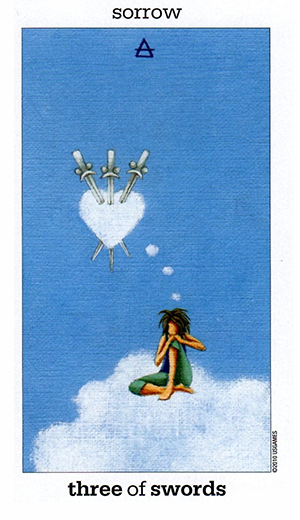 The Three of Swords can refer genuine feelings of loss of course. It can represent a breakup or heartache or even a sense of being stabbed in the back. But make sure that what you’re dealing with is real (and deserves your attention) and not just all in you head. If you’re dealing with the aftermath of something real today, take some time to tend to your broken heart. It won’t do you any good to ignore it, but sitting around ruminating on your loss can make it seem so much worse than it is. You may be hurting to the core of your very being — but know that it may be a necessary part of your story and that you do have it within your own power to prevail. The Three of Swords serves as a powerful reminder that each of us has it within us to overcome adversity and to come out stronger and wiser in the end. As Venus enters Virgo today, you may be thinking more about perfecting your skills and honing your craft. The Eight of Pentacles — this version from the Sun and Moon Tarot — is called the “apprenticeship” card, a reference to the dedication that is put into refining everything you do into something you can be proud of. It refers to taking on an interest — a brand new one or a lifelong dream — and devoting yourself fully to it. It doesn’t have to be career related, but because it’s a labor of love wouldn’t it be great if it were? Doing what you love and seeing the money follow is something we all aspire to achieve. It can be as simple as being 100 % focused on your work and wanting to show the powers that be your level of dedication and service. And it can be as innovative as taking something you are uniquely capable of and turning it into a career. The Eight of Pentacles (as well as Venus in Virgo) can refer to an all-work / no-play mentality. But this is all relative, as the hours that you’re putting in will likely not feel like “work” at all. Not if you truly love what you do. This is about being fully engrossed in what you’re learning, creating or developing. 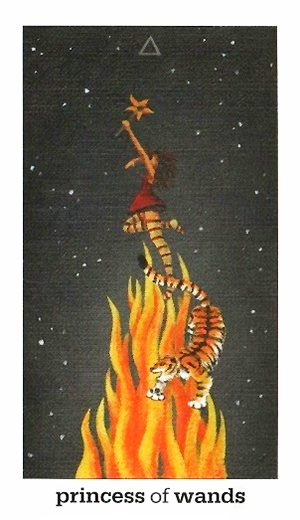 Today’s Moon in Leo sits between Venus and Mars, making for a great time to reach for the stars. This aspect is warm, expressive, creative and dynamic — very much like the Princess of Wands. The Princess of Wands can motivate and inspire you in your own life too. Ask yourself in what areas have you been too timid or uncertain, and how might incorporating some of her passion and bravery into your own life work to your advantage? Use this time to tap into your creative potential and save the business of accomplishing something big for another day. Today is a day for seeking answers to life’s most pressing questions by meditating and reflecting on your goals. 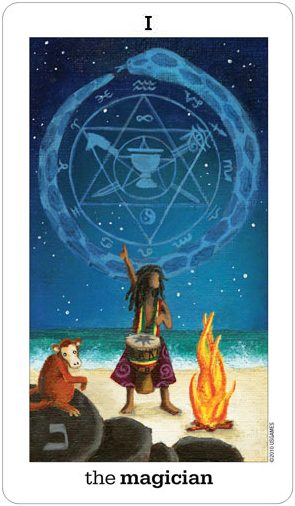 The Hermit card represents a retreat from all the noise and distractions that surround you in order to access your inner reserves of knowledge and wisdom. In this version of the card — from Vanessa Decort’s gorgeous Sun and Moon Tarot — the Hermit stands before a faded parchment marked with esoteric teachings. She holds an hourglass in one hand and the trident of Shiva (Trishula) in the other. The symbols on the parchment are in ancient Sanskrit with the Om symbol at the top and the Hebrew letter Yod (representing the omnipresence of God) at the bottom. As the Hermit card also refers to turning inward, there is an entire spectrum of information — from the depths of the psyche to the heights of conscious awareness that can be accessed through this process. 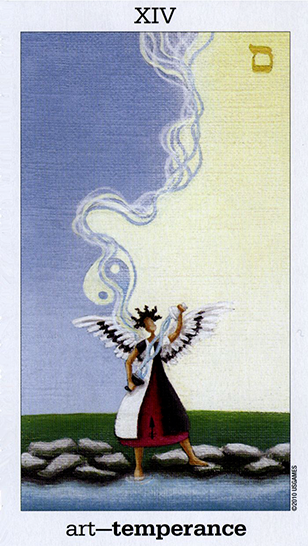 The Hermit card is not about avoidance, it’s about finding your inner light and choosing to follow it. 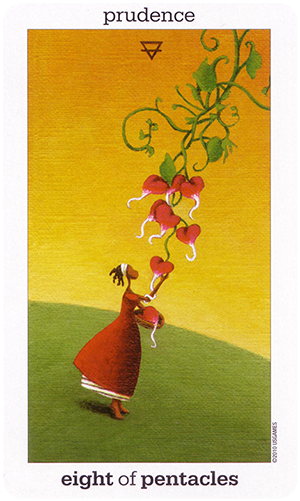 Or like the woman in this card, choosing to understand it and share it with others. Today you get to choose whether you’re lighting your own way or acting as a guidepost for those who have wandered away from theirs. Both are valid endeavors ,and only you will know which is the right path for you. With Mars and Uranus sextiling today in Gemini and Aries, you may feel like you can accomplish anything! This aspect is innovative and dynamic;it brings together the two planets best suited for creating “magic” in the signs best known for energy, action and initiative. But the figure in this deck is not your typical Magician. He marches to the beat of his own drum, which is so fitting for the Mars / Uranus sextile. The Monkey in the foreground is also fitting as monkeys are known to be clever and playful creatures who embody the spirit of the Magi. Take some time to today to think about what makes you unique and what skills you and you alone possess. Every one of us has something that we’re so passionate about — and properly channeled, this can become your calling. You may find yourself in the position of having to stand up for you believe in today, even if it means standing up against others. 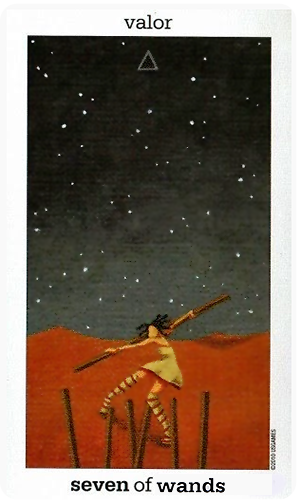 The Seven of Wands speaks of a need to be more alert, guarded and cautious, rather than accepting things at face value. You may face opposition from others — in the form of competition or outright resistance. You may feel attacked or ganged up on. You may also have to reconcile a “me against the world” attitude before it turns into a chip on your shoulder. This is not the time to rest on your laurels. You need to be braced for attack as your views are more than likely going to rub others the wrong way. 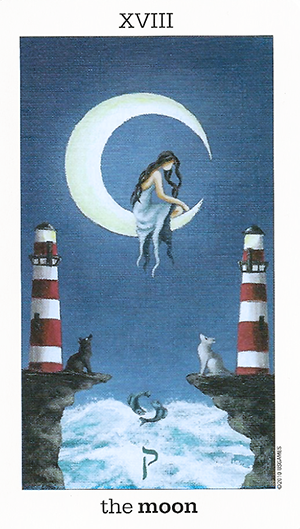 The woman in this card — from the beautiful Sun and Moon Tarot — may be outnumbered. 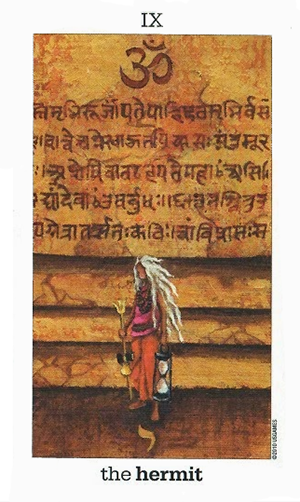 There are Six wands raised against her while she has only one. But she’s wisely positioned it in a protective stance so that no part of her being is vulnerable. This is the message behind the Seven of Wands. You don’t cave in and you don’t cower in fear. Instead — like the woman in this card — you hold your ground and defend your turf, never wavering from your commitment to valor. There’s a synergy that pulls two people together and echoes their feelings back to one another. In this respect the Two of Cups is more about falling in love with yourself, as seen through your partner’s eyes. 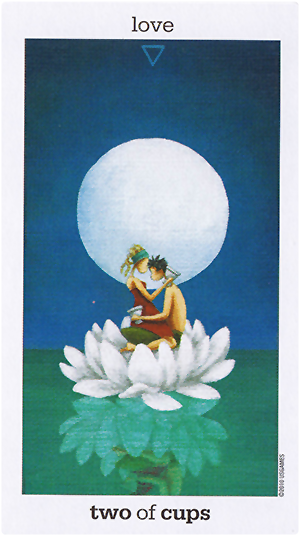 In this version of the card — from the beautiful Sun and Moon Tarot — a young couple sit in a giant lotus blossom and share a loving embrace under the light of the full Moon. A portion of their images are reflected below them in the surface of a tranquil pool. The Two of Cups often refers to a brand new relationship — one that hasn’t fully gotten off the ground. It’s more about falling in love than it is being in love. It’s more that heady state of limerence than the settled state of long-term relationships. Whether it can stand the test of time is still up in the air. But established relationships can also use a reminder of what it was like to fall in love. You may spring out of bed today with a renewed sense of enthusiasm and optimism. Perhaps you’ve gotten good news. Or maybe you’re making a conscious decision to approach life from a place of joy and gratitude. Either way, you’re going to see that the Universe responds in kind. Like attracts like and as you shift your attention toward what’s right in the world, more things will fall into place around you. The figures in this card embody this energy perfectly. They skip gleefully through a field of sunflowers, seemingly without a care in the world. The Sun shines down upon them from behind, the glyphs for the twelve zodiac signs etched in its rays. These symbols remind us that we’re already whole and perfect just as we are. We’re all comprised of the entire spectrum of archetypes that both connect us to each other and make us uniquely ourselves. The lotus blossom in the center of the Sun represents purity and enlightenment. The Hebrew symbol ר (Resh) at the base of the card refers to comprehension, illumination and awe. There’s a child-like wonder seen in this card. The figures are not only barefoot but they’re equipped with wings. If you look closely you’ll see that their feet barely touch the ground. They could use those wings and take flight at any moment. The Sun card is all about optimism, enthusiasm and personal radiance. It’s about being yourself and allowing yourself to “shine,” without any pretense or constraint. No matter where you are in the world — even those of us dealing with the bitter cold — the Sun is shining brightly in the sky. We may not always see it but it’s always there — and serves as a reminder of the warmth and vitality that each of us possess. It’s all about balance today and you may find yourself needing to add an extra dimension to your level of awareness as to how calm you feel as the Sun squares Mars which does not usually make for a day of peace and tranquillity. On the plus side though Mercury trines Neptune which gives you an added boost to being able to get in touch with your inner self and allow this to wash through you much like the image of the 2 cups in the hands of the figure in this card. You cannot help being struck with the nature of the balance in this version of Temperance. Everything in the card is showing different states. From the yin yang symbol in the two toned sky, the figure with one foot in the water and one out, the flow of water from one cup to the other and even the one arm raised to the sky whilst the other is pointing to the earth. It is a card about balance and letting things flow. You are aware of the polarities around you and that life is not always meant to be easy. You take the good with the bad and you have a knack for turning more of the bad into good in a way that benefits you positively. The planetary aspects of Sun square Mars perfectly depicts the tensions you may feel today alongside Mercury trine Neptune which perfectly shows just how illuminating your thoughts may become if you step outside of yourself today and contemplate life.